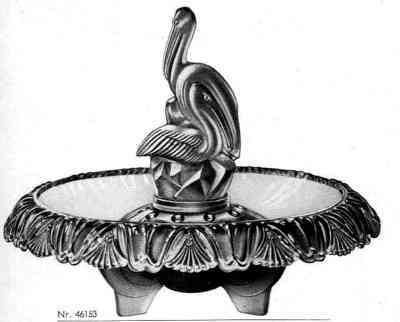 The Walther company produced a large range of distinctive styles in bowls and comports. the styles are very different from those produced by Davidson. This is not a static catalogue, but grows as more examples are found. 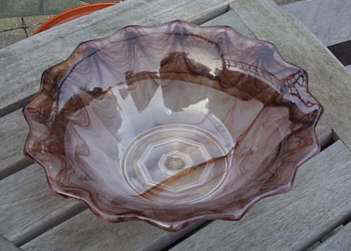 Description: Circular bowl with rippled edge and an impressed octagonal design in the base. 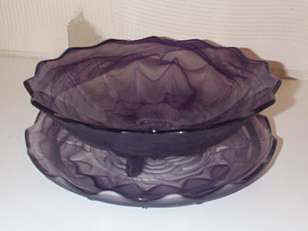 Description: Oval bowl, most likely a bread basket, with rippled edge and an impressed octagonal design in the base. Description: The bowl has two handles and a leaf motif around the rim. 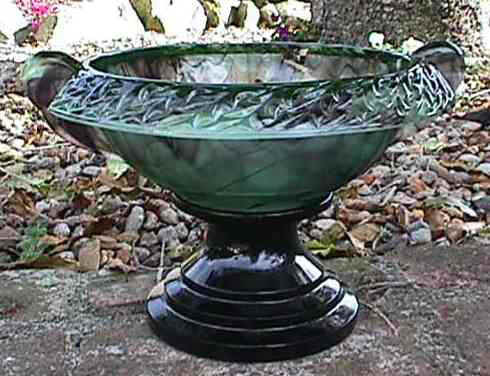 In the centre of the bowl is an impressed holly leaf design. 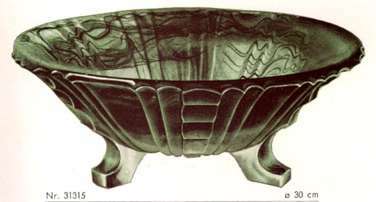 As well as having a black stand, the Berlin bowl was also sold with an elaborately moulded flared foot. 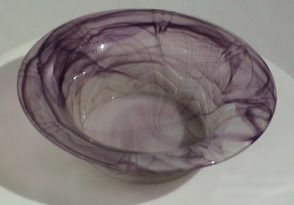 A similar bowl without handles is also seen in Topaz-Violet. 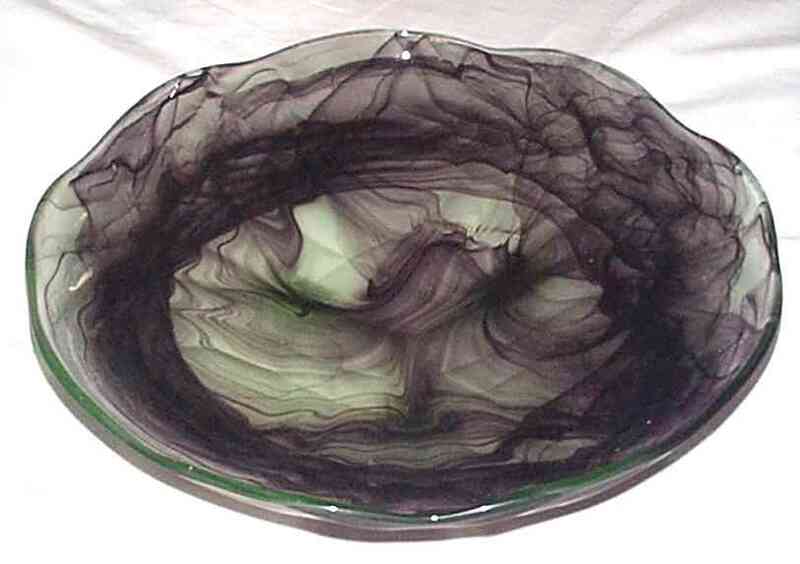 Description: A circular bowl with turned over rim. This bowl is similar in overall to the one above The outer surface is moulded into three 'steps' and is divided into 12 vertical sections. 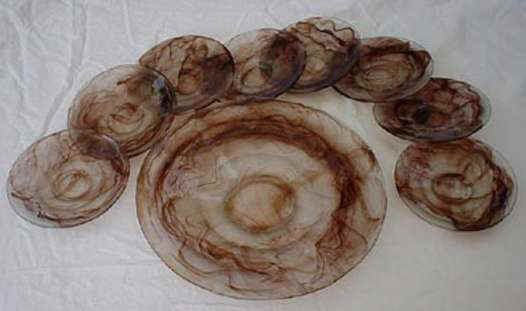 Description: shallow plates or dishes. The rear moulding of these plates is similar to the two bowls above. Description: A circular 'Dish for sweets' with stepped sides. Description: This sweet dish is based on the example above, except that the sides have been folded up to form a bowl. Description: Circular bowl on three small feet with vertical ribs. 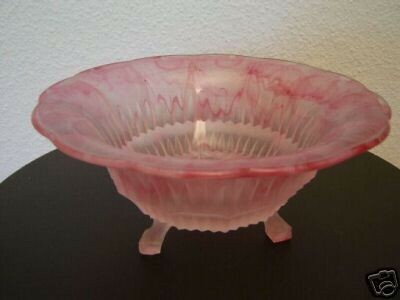 The example shown here is in the rare Pink Cloud Glass. Description: A large circular comport on three feet with impressed pattern on the reverse. 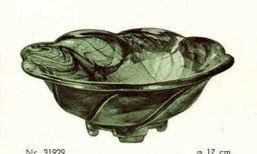 This comport was part of a suite of glass which included bowls and vases which were also made in Cloud Glass. Description: Like the comport above, this bowl was part of a large suite of glassware. 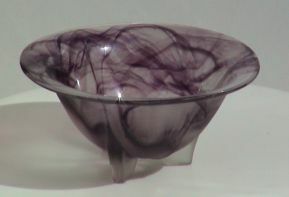 This bowl also came in smaller sizes of 23cm and 27 cm diameter in non-cloud colours. Description: Circular bowl on three rectangular feet and with a turned down rim. This bowl was also sold with a powder tassel with attached figure, Catalogue No 31471. Description: Circular bowl on three rectangular feet and with a turned out rim. Description: A six sided bowl on three rectangular feet. Description: A circular bowl with three round feet and lid. 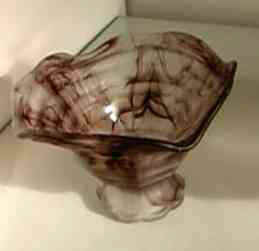 In non-cloud colours, the Mathilde pattern had an impressed floral design on the side of the glass. 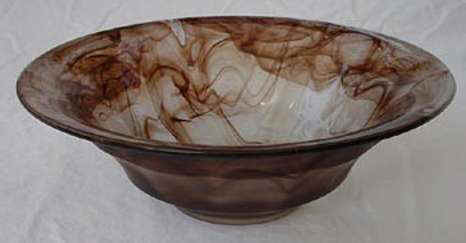 Description: A large circular bowl with three round feet and a crinkled rim. A number of other round and oval bowls in the Mathilde suite, all having three round feet, are also known to occur in Oralit colours. 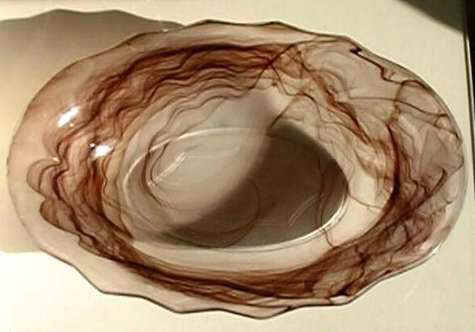 Description: A round bowl. 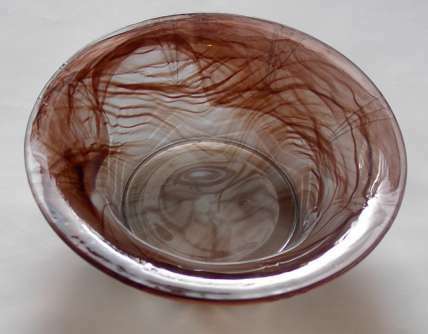 The bowl has a distinctive chevron pattern around the side. 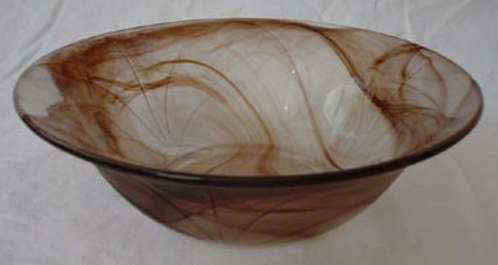 Description: A circular bowl with turned over rim. The fan shaped design on this bowl appears in other patterns, including fruit sets and deep bowls and plates. There were many different shapes in the Orla suite including some plates which were also produced in cloud glass. 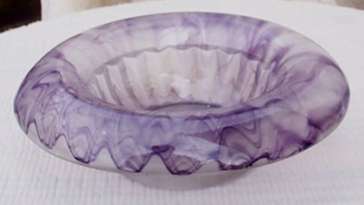 Description: A circular bowl or dish with the fan shaped design on reverse. Description: This oval bowl is commonly known as the 'Maori' bowl after the moulded decoration on the underside of the bowl. The candlesticks were not sold with the Pauline bowl. 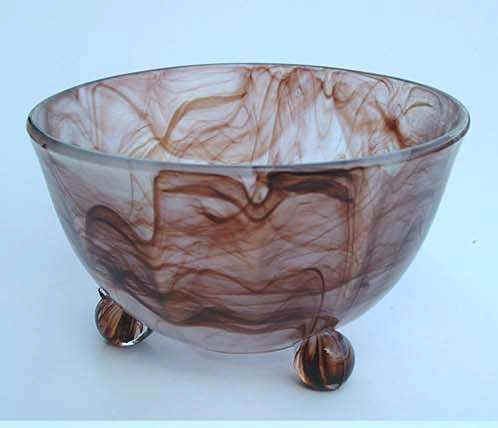 Description: The three-footed bowl has a smooth interior and and intricate moulded rim. The centre-piece is in the form of a Pelican. 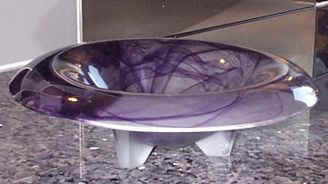 The bowl was also sold with the 'Helgoland' centre piece. 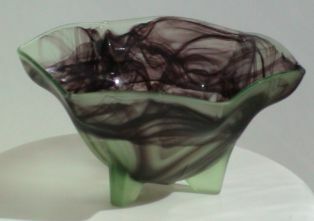 This bowl is normally found in Cloud Glass without the centre piece. Description: This rectangular dish sits on four square feet. The catalogue number for the non-cloud colours was 45981. Description: An impressive two-piece centre piece. Walther produced many of these large centre pieces, only a few of which were made in Oralit. 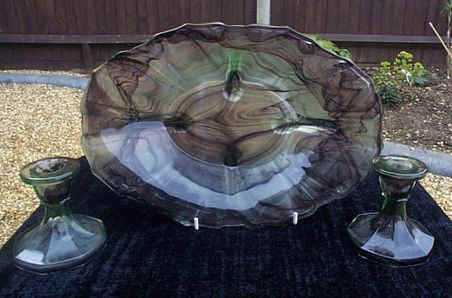 Description: A circular sweet dish with a wavy edge standing on four feet. A feature of the Primus design is the vertical moulded lines which twist towards the right at the top. Description: A circular bowl standing on four feet with a turned down rim. 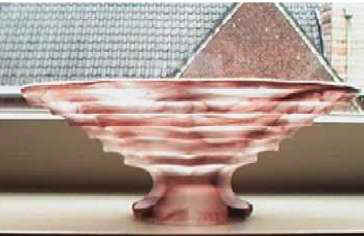 Description: This bowl is an almost exact copy of the Davidson 1910 BD bowl. The main difference being the lack of a toothed decoration at the top of the moulded ribs. 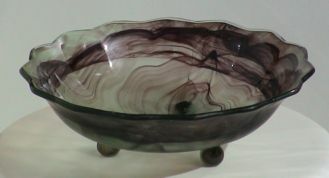 They also did a version of this bowl with a flat rim similar to the Davidson 1910 F style. 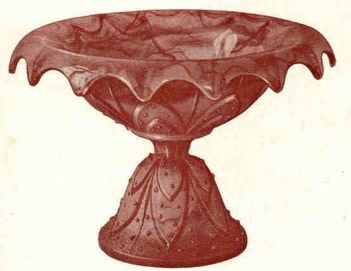 Description: A circular bowl standing on four feet with a flared rim. 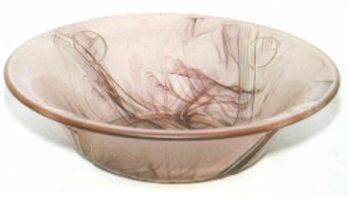 The bowl has a series of horizontal banding. 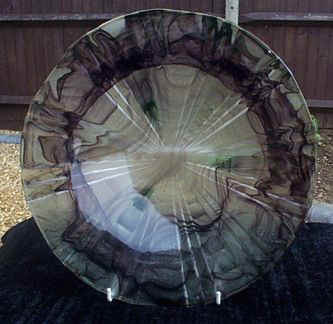 Description: This large three-footed platter has a wavy edge and a moulded pattern on the underside. This pattern consists of three concentric circles and is repeated three times around the base. This style was also made in other shapes. 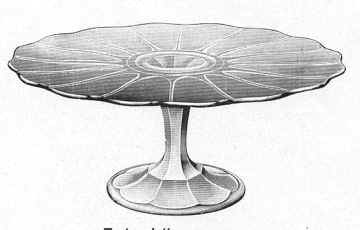 Description: A circular flower bowl with flower dome. This is one of the very few Oralit styles which came with a matching flower dome. Description: Watercress dish and plate. The bowl has 5 holes in the base to allow water to drain into the plate. The bowl and plate were sold separately (cat Nos: 21766 and 21767 respectively). The Zentrum suite has a distinctive curved hexagonal design in the base. 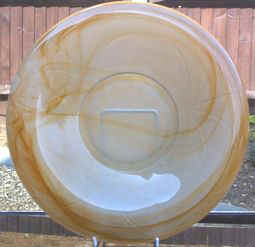 The catalogue numbers for the non-cloud colours were 21766 (bowl) and 21767 (plate). Description: A bowl similar in shape to the Mignon bowl described above. The bowl has a pattern on the side which consist of small circles each divided into sections. The circles are intersected by a band of lines which run down the side of the bowl at an angle. 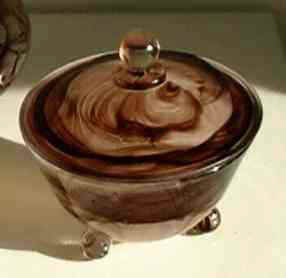 On the base of the bowl is a pattern consisting of three linked circles similar to the Olympic Games symbol.